“In many cases, unless you’ve seen someone making that dish in its element and in the place it was created, it’s really hard to respect food the way food should be respected,” McCoy said. Today, he quipped, he envisions a little old lady from Thailand sitting next to him whenever he makes his papaya salad. This woman represents the street vendors he grew to love there. If he gets the salad wrong, she scolds him. There is very little, if anything, to find wrong about Duke’s Grocery, the 17th Street pub McCoy founded with two business partners a little over a year ago. The cozy, friendly establishment seems like an extension of the affable McCoy’s personality. And it serves up food he knows very well. McCoy’s parents grew up in London and met there. Starting from his birth, he would travel there a lot with his mother, a chef, and his father, a government official. And from a young age, he experienced traditional British and immigrant foods that pervaded the city of London, particularly its East End. 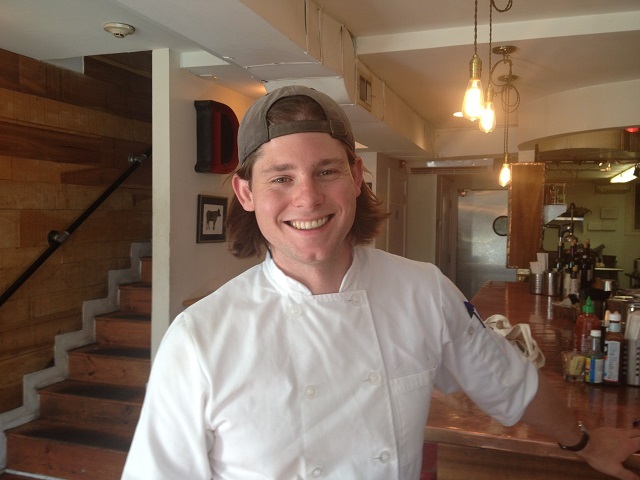 Eventually, McCoy determined he too would be a chef, and worked at various restaurants, eventually running the kitchen at the Rugby Café in Georgetown until it closed. But a couple of equally influential things occurred along the way. McCoy and his brother won an NBC television competition called Chopping Block in 2009, which led to an opportunity to work with Marco Pierre White, who is now enshrined in portrait at Duke’s. McCoy also has worked with Roberto Donna, most notably managing the bar at Al Dente, where Donna shared his love of Italian food with the younger chef. McCoy vowed to open his own place by the time he was 30 years-old, and indeed signed the lease on Duke’s only days before his deadline. Once McCoy and his two business partners set the restaurant in motion, he knew the kitchen would draw its inspirations from East London, and specifically the neighborhood of Shoreditch, home to Brick Lane curries—and in my opinion an endlessly fascinating nightlife scene. “I kept hearing people talk about how the food in London is terrible. I kept saying to myself, ‘Well, you don’t know London then, because there’s fantastic food in London!’” McCoy declared. London itself has a truly international atmosphere, McCoy said, and nowhere is that more obvious than during a walk through Shoreditch, where you can find a banh mi shop, a funky bar, a traditional pub and a Bengali restaurant in the same block. There along Brick Lane, a stone’s throw from the famous Rough Trade East record shop, you’ll find the world-famous Beigel Bake, home to a renowned brisket called salt beef, a dish Duke’s Grocery has introduced to D.C. with resounding success. The international backdrop of East London and its immigrant-heavy population also gives Duke’s Grocery an opening to put a lot of different dishes on its menu. While the international flavor of Duke’s cuisine might go over well with the denizens of well-traveled D.C., McCoy thinks the comfort of a local, familiar spot has just as much if not more to do with the success of Duke’s Grocery to date. A comfortable, familiar space gives McCoy an opportunity to introduce his diners to things they may never have tried previously. By the same token, McCoy favors a familiar format for delivering that food—sandwiches (or “sarnies” in the British vernacular). The Brick Lane Salt Beef (the signature brisket of which appears in other sandwiches like the Ruby on Rye) was a hit in part because it was new yet familiar, McCoy said. The salt beef has been surpassed in recent months by the Proper Burger, which has won accolades at home and across the country for being remarkably tasty. McCoy originally resisted the idea of a burger because he wanted to avoid typical D.C. “pub grub.” He warmed to the idea eventually but he wanted it to be the best it could be. McCoy personally enjoys the curries at Duke’s Grocery, which are made from scratch. He’ll ship ingredients from India to get them right (just as he sources authentic ingredients for all of his dishes). In the future, McCoy plans to expand his kitchen so that he can offer the salt beef all of the time instead of only periodically, as it takes two weeks to prepare the beef, which then sells quickly at 600-700 lbs. a clip. “I generally don’t plan menus ahead of time. They appear when they appear,” McCoy confessed. That said, he is interested in adding charcuterie, cured bacon and homemade pastas to the rotations on Duke’s menus. And he would like to see more Indian curries on a regular basis, along with tikka masala, lamb vindaloo and Indian Dal. Personally, I discovered Shoreditch and its wonderful variety of food, the very staples of Duke’s Grocery, because of my own musical interests. During several visits to London, I’ve done little other than shop at Rough Trade, hit the stages and turntables during the Stag and Dagger music festival, or marvel at the environments that housed such places as John Foxx’s recording studio The Garden. So of course, I had to ask McCoy about his own taste in music. “My menu is very representative of my music choices–a little bit of everything,” he said. Today, that includes some EDM as well as classic rock and modern R&B. Duke’s Grocery has won praise for its music playlists as well as its food, and the observation sparks McCoy’s enthusiasm. “The ambience is as important as the food. Restaurants live and die off details, and the nuances are the most important thing,” McCoy said. And so all details of a restaurant are equally important, he said. Hold them all the same level of care—whether lighting, music, food, service or bar.